Some Sanpete County schools continue to fall below the state norms on Student Assessment of Growth and Excellence (SAGE) testing, while others rise above. However, lawmakers agreed on changes to Utah’s school grading system with a goal to drive improvement, although the changes have left some administrators frustrated with the outcome of school grades. The SAGE test is a standardized state exam taken yearly by all grades third and up. Students test in Language Arts (LA), math and science subjects. NSSD math scores show students tested at 42 percent “proficient,” five-percentage-points below the state average. In the subject of science, students averaged 41 percent “proficient,” while the state sits at 49 percent. 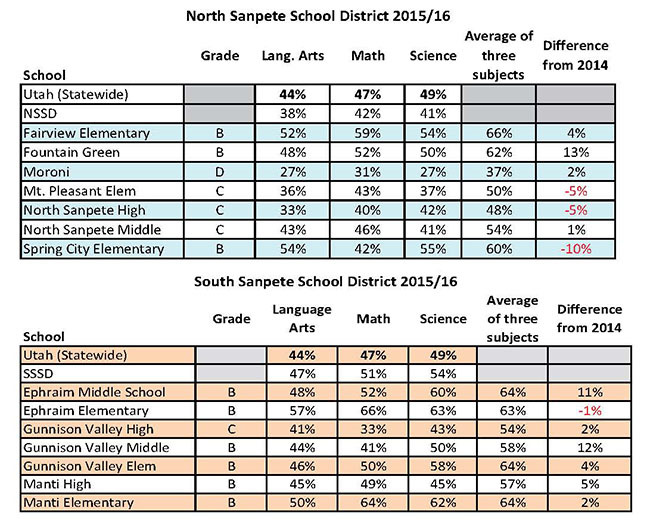 The SAGE testing results show average NSSD student scores dropped by one-percentage-point in LA, three-percentage-points in math and two-percentage-points in science compared to the 2014-15 test. The reports show opposite results for students in the South Sanpete School District (SSSD), with scores sitting above the state average. The average result for LA proficiency is 47 percent. Students tested at 51 percent “proficient” in math and 54 percent “proficient” in science, five-percentage-points above the state average. Several variables contribute to overall proficiency percentages, including school population and the ability to opt-out of SAGE testing. Earlier this year, Representative Kraig Powell, R-Heber City, proposed a bill that would allow teachers to use the SAGE test as sort of a final exam, so students put forth their best effort during testing, but the bill was turned down by the Legislature. The result is why NSSD Superintendent Dr. Sam Ray says scores might not be as high as they could be. Instead of passing Powell’s proposal, the House Education Committee said the percentages required to receive a letter grade of A, B, C, D or F would remain unchanged until at least 65 percent of schools in the state earn an A or B grade. Now that schools have achieved this benchmark, the law requires a five-percentage-point increase in the minimum score for each grade. The new grading system structure left SSSD Superintendent Kent Larsen frustrated with the result of district school’s grades. Before the five-percentage-point jump, SSSD schools had all earned A’s, except one. But those A’s were immediately stripped away, swapping every A to a B and the B to a C, the grade earned by Gunnison Valley High students. Larsen says because faculty and administrators reached their target goal, he plans to continue using the original grades the district received. Three of NSSD schools earned B’s; Fairview Elementary, Fountain Green Elementary and Spring City Elementary. While no school in either district garnered an F, one school that continues to struggle is Moroni Elementary, earning D’s both years. Moroni Elementary Principal Stacey Peterson said faculty and students have set a goal to earn at least three-percentage-points higher for the next SAGE exam. 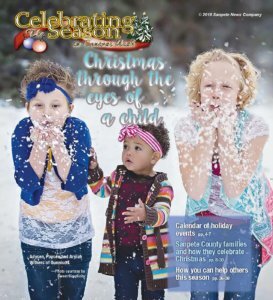 Although Moroni Elementary sits at the bottom of the chart for schools in either district, Peterson says the students and faculty have things to celebrate, such as a comparison of other state schools with similar demographics. “You can see that when we’re compared with other schools with high poverty and high ethnicity, we’re moving on up,” she said. With the continual fluctuation of how the state grades schools, Ray says NSSD will turn their focus outside of common core.